Hoa Lo Prison was a prison used by the French colonists in Vietnam for political prisoners, and later by North Vietnam for U.S. Prisoners of War during the Vietnam War. 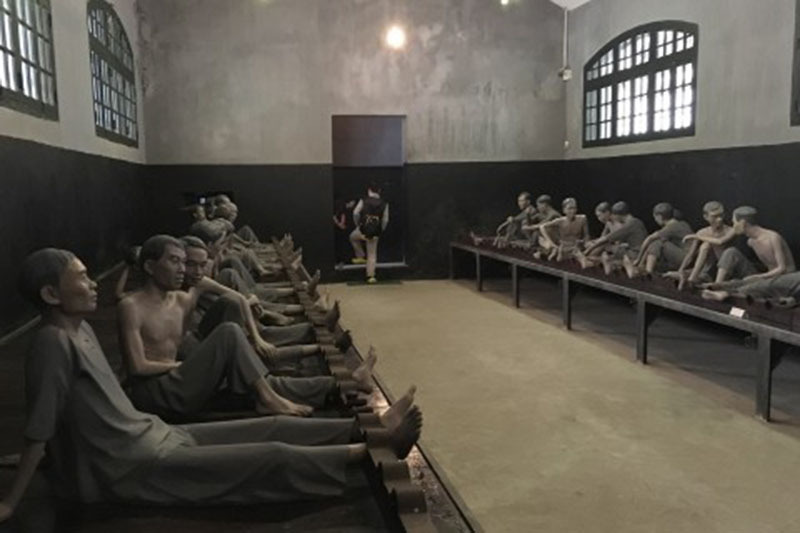 Originally sprawling over 13 hectares, Hoa Lo Prison, better known as the Hanoi Hilton to Westerners in one of its later iterations, was one of the largest prisons built by the French in Indochina. 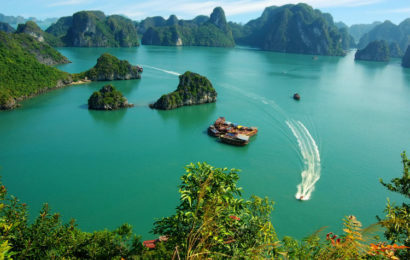 Opened in 1896 on the site of razed ceramics village Phu Khanh, the French simply called it Maison Centrale; Hanoi has grown around it to such an extent that it is now located near the town centre. 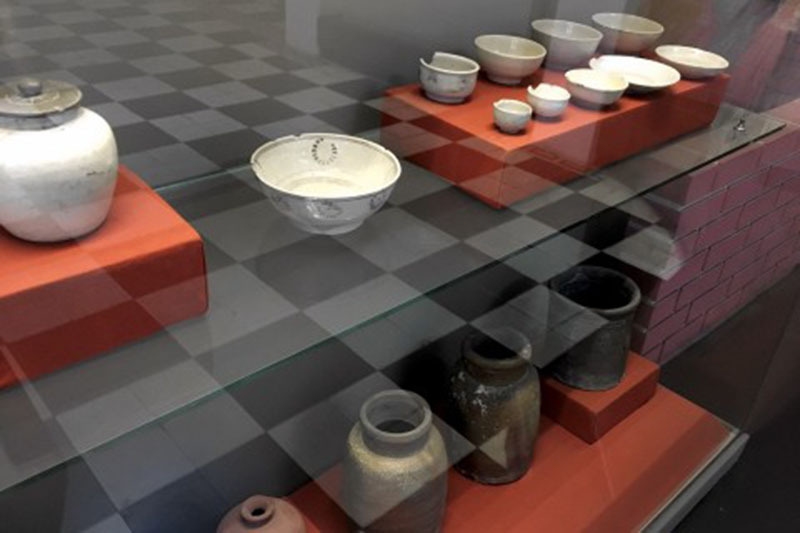 Artefacts on display include ceramics produced at the village the French destroyed to build Hoa Lo. Photo taken in or around Hoa Lo Prison (Hanoi Hilton), Hanoi, Vietnam by Samantha Brown. 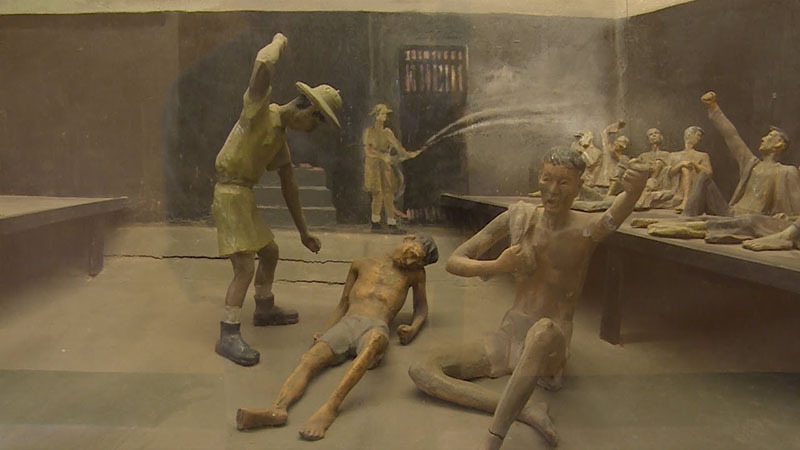 The prison’s original purpose was to function as the end of the assembly line for the colonial system of jurisprudence, detaining Vietnamese criminals who were more often than not anti-colonial revolutionaries (otherwise known to the Vietnamese as ’revered heroes and martyrs’). It was the inmates who dubbed it Hoa Lo, which means ’fiery furnace’. Cell D, for instance, from 1930 to 1945, held up to 100 political prisoners in an area designed for 40. Surviving Hoa Lo better yet, escaping from it gave a Viet Minh cadre powerful credentials, and more than a few of those who did went on to become central figures in the Communist Party. The museum’s curators focus primarily on this period of the prison history, but after the French were ousted in 1954 it was used to incarcerate a new set of Vietnam ’criminals’: counter-revolutionaries opposed to the growing influence of the party. The prison in its original state. Photo taken in or around Hoa Lo Prison (Hanoi Hilton), Hanoi, Vietnam by Samantha Brown. Then, during the American War, yet another new group of ’liberators’—or despicable imperialist bandits—were detained in the form of downed American pilots. From 1964 to 1973, Hoa Lo served as a prisoner-of-war camp and once again received a new, unofficial name: the Hanoi Hilton. The Vietnamese maintain that American prisoners were well-treated, but published memoirs by former inmates speak of torture, murder, medical neglect, and being fed food contaminated with faeces. The treatment was so bad here that some observers still maintain it constitutes a war crime. The Hanoi Hilton name became so resonant in popular culture that when the Hilton Corporation finally opened a hotel in Hanoi 1999, they had to awkwardly name it the Hilton Hanoi Opera to avoid tapping into any dark associations. For some Americans, surviving the Hanoi Hilton boosted their credentials, as it did their Viet Minh predecessors. One former prisoner became the first US ambassador to Vietnam and another was US Senator and one-time presidential hopeful John McCain. A highlight for many visitors is in one of the last galleries, which displays McCain’s flight suit and parachute, and a picture of locals pulling him out of the water after he crashed his plane in Truc Bach Lake. Photos also show him years later revisiting the prison, where he reports being so mercilessly tortured he tried to commit suicide on several occasions. One of the old cells on display. Photo taken in or around Hoa Lo Prison (Hanoi Hilton), Hanoi, Vietnam by Samantha Brown. After 1975, the location was once again used to jail Vietnam who spoke out against the Communist government. This continued until at least the early 1990s, when the government realised they were wasting a prime piece of downtown real estate. 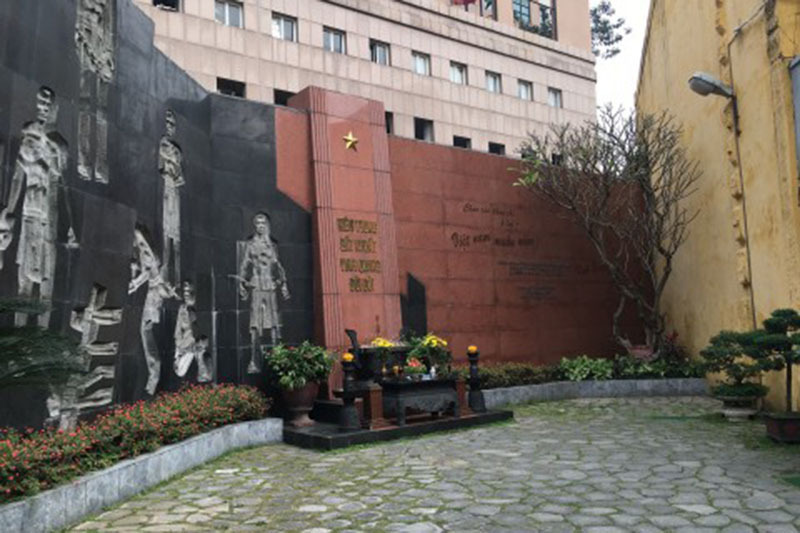 Most of the prison was destroyed and sold in 1993 to developers to create the Hanoi Towers, and the southeast portion was preserved as a memorial “to the revolutionary patriotic soldiers who heroically laid down their lives in Hoa Lo Prison for the independence and freedom of the nation”. 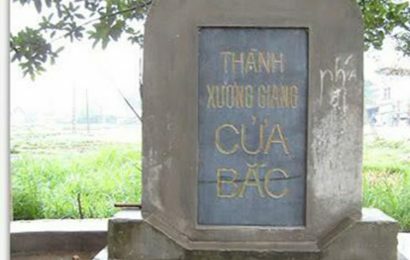 Today the site mostly memorialises the suffering of Vietnamese revolutionary martyrs before 1954, and glosses over the other periods. Still, the prison is absolutely worth seeing. Be prepared for some grim sights, including dank, dismal cells, iron stocks, upsetting photographs and the chilling presence of a guillotine used to execute some untold number of inmates. The memorial to one side of the museum. Photo taken in or around Hoa Lo Prison (Hanoi Hilton), Hanoi, Vietnam by Samantha Brown. A few of the cells feature relatively life-like, slightly creepy renderings of suffering prisoners. Other displays show the narrow sewer grates that a large number of prisoners squeezed through to escape. A serene memorial area out the back lends a gravitas to the location. 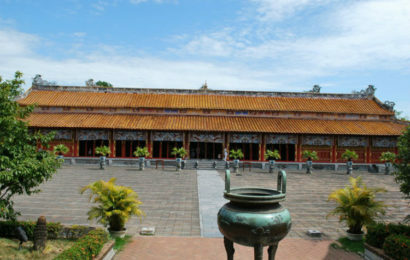 All in all, this is one of the best and most interesting historical sights to see in Hanoi. 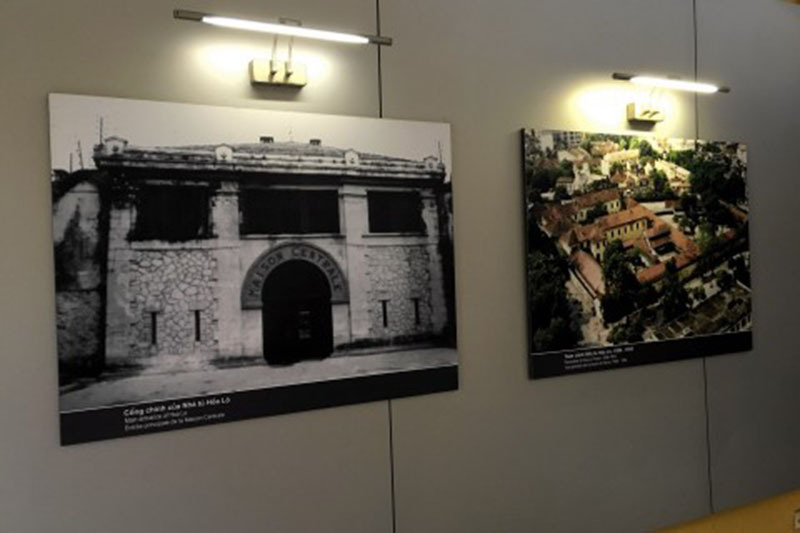 While you’re in the area, the Hanoi Police Museum is located a few hundred metres away across the road, and while it’s not an essential sight like Hoa Lo, it is an interesting, propaganda-driven look at the history of the Vietnamese police force in Hanoi.